Enjoy the old world ‏atmosphere of Quebec City with its narrow streets, steep hills and numerous historical treasures on the banks of the St. Lawrence River. Perched on a cliff above a narrow point in the St. Lawrence River, Québec City is the oldest municipality in the Québec province. The well-preserved Vieux- Québec (Old Québec) is small and dense, steeped in four centuries of history and French tradition. The ramparts that once protected the city, 17th and 18th century buildings, and numerous parks and monuments are here.The government of Québec has restored many of the centuries-old buildings of Place Royale, one of the oldest districts on the continent. Because of the site's immaculate preservation as the only fortified city remaining in North America north of Mexico, UNESCO has designated Vieux-Québec a World Heritage Site. 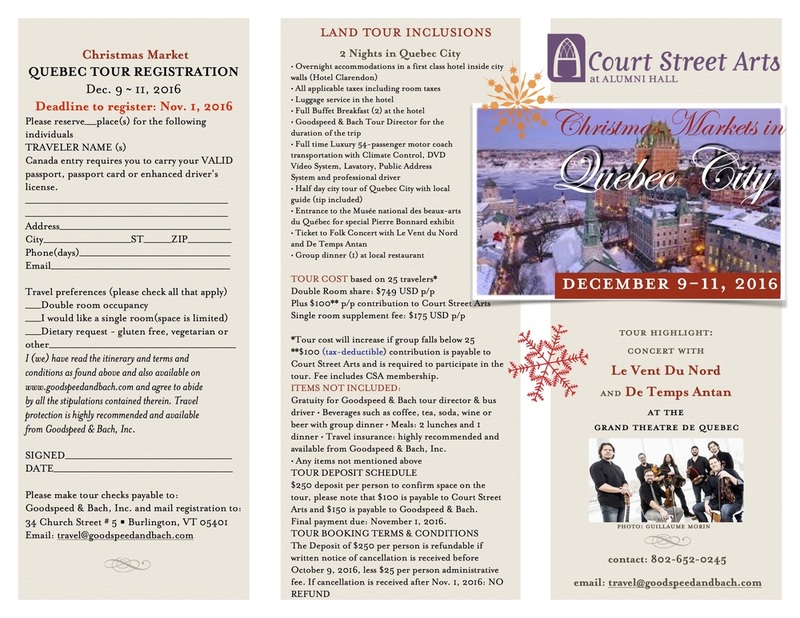 Join this two-night adventure to Quebec City and explore ‏the German Christmas Market, the Musée national des beaux-arts du Québec featuring a special traveling exhibit of works by Pierre Bonnard, and a concert at the Grand Theatre de Quebec featuring two dynamite Francophone groups - Le Vent du Nord ‏and De Temps Antan.